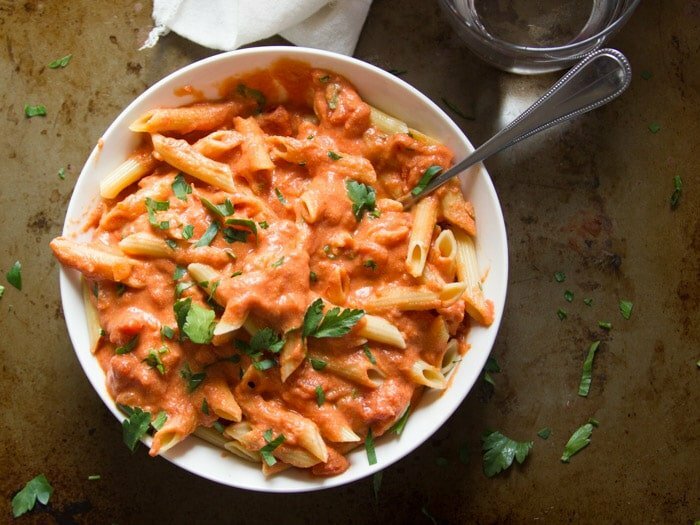 This vegan vodka sauce is made by blending up raw cashews, so it’s rich, creamy and delicious. I’m not exactly sure why Vodka Sauce says “romance” to me. Maybe it’s the whole pasta thing with Lady and the Tramp, or perhaps it’s the fact that Rachael Ray dubbed her version of the dish You Won’t Be Single for Long Vodka Cream Pasta. Personally, if I were to get a romantic dinner it would probably involve some tofu and fresh veggies (hint, hint, somebody who I hope reads this), but I do love me some vodka sauce when I’m in a splurging mood, and I suppose Valentine’s Day is just the time for splurging on some vegan vodka sauce. I remember a few years ago one of Oprah’s nutritionists counseling her on air that she couldn’t drink alcohol if she wanted to maintain her weight, to which she responded that she was at least going to have a glass of wine on Valentine’s Day. It must be okay if Oprah thinks so. Splurge away! This sauce is completely animal product-free, but totally rich, thanks to the magic of raw cashews. Very splurgable. 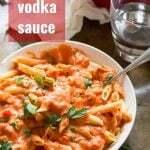 My vodka sauce actually started out years ago as an adaptation of the Rachael Ray sauce, but has since evolved into something different. In actuality, I don’t typically even eat this on pasta. If I did that I’d be snoring away within fifteen minutes of finishing dinner, leaving a very lonely Valentine. The pasta in the photos did get eaten (thanks to my husband), but when dinner time came around I opted to pour this sauce atop some grilled polenta slices and Field Roast links, which was fantastic. This would also be delicious over spaghetti squash, roasted veggies, or in a vegan lasagna. What’s your Valentine into? I’m sure whatever it is you can work this sauce into a delicious romantic dinner. This recipe makes a very big batch, but I don’t recommend scaling down on the batch size unless you have a small blending device. Otherwise the cashews might not blend fully! The sauce is very freezer friendly! So use what you need and freeze the leftovers. 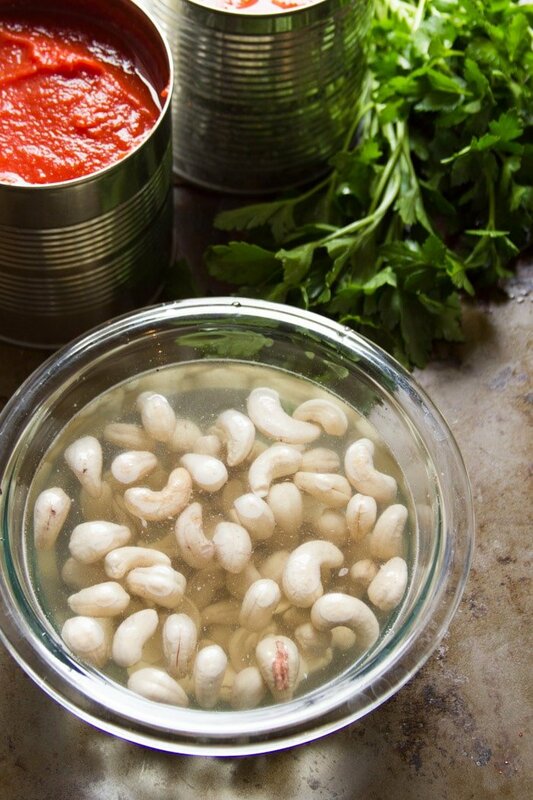 Did you forget to soak your cashews? Try boiling them for 20 minutes instead. And for future reference, keep a stash of frozen soaked cashews on hand, so you never have to worry about forgetting! Just soak them and freeze them right in the soaking water. Then thaw, drain, rinse, and use like normal. 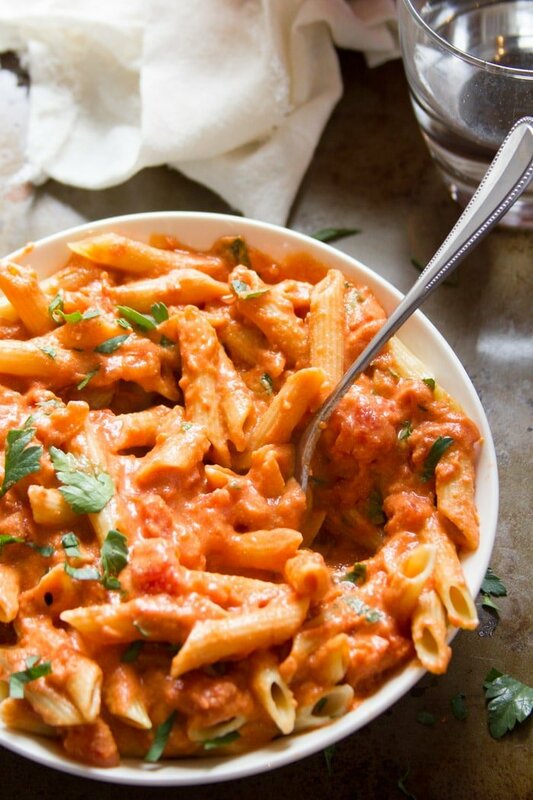 This vegan vodka sauce is made by blending up raw cashews, so it's rich, creamy and delicious! Place the cashews and water into a food processor or blender. Blend unitl smooth, stopping to scrape down the sides of the pitcher or bowl as needed. Heat the oil in a large pot over medium heat, When the oil is hot, add the onion. Sauté for about five minutes, until softened. Add the garlic and continue to sauté for another minute, until very fragrant. Stir in the crushed tomatoes, diced tomatoes and vodka. Bring the mixture to a simmer and reduce the heat to-medium low. Continue simmering for about fifteen minutes, until the sauce thickens a bit and the alcohol has cooked off. Stir the cashew mixture into sauce and bring it back to a simmer, just for a minute, until heated throughout. Remove from heat and season with salt and pepper. Serve over pasta of choice and garnish with fresh basil or parsley. Since publishing this recipe, I've gone back and edited the post and updated the recipe to double the batch size, simply because many blending devices aren't large enough to completely blend a small batch of cashews. If you have a smaller device feel free to cut the recipe in half. i will definitely be making this very soon. Thanks for sharing. Can you get a Print tab on your posts so I can just hit that link and it goes into print format? I love your blog! You’re actually the second person to ask about a print button in the last week or so. I will get on that very soon! Hi Maureen. Just an update – I added a print button to this recipe. I’ll be including this in all future recipes and hopefully I’ll get around to adding it to my old ones! Hi there! Just made this sauce tonight, and this was so amazing! Perfect, rich, and creamy in every way! 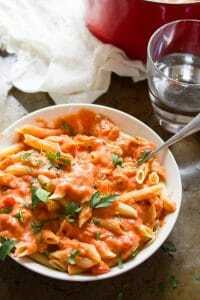 I feel like I need to add that I have decided to go vegan a couple of weeks ago (I have gone back, and forth on this endeavor since I was a child), and this sauce is better than any dairy- based ala vodka sauce I’ve ever tasted! Thank you! I’m so glad you enjoyed it! Thanks so much! Looks pretty vodka-saucy! It is an indulgence, but sometimes its needed. I made this last night with brown rice noodles and it turned out really good! Love it. The process looks really nice. For sure I will try this today with my favorite Anestasia Vodka. As far as a substitute for vodka, I’m not sure there is one. You could just leave it out, though the flavor might be a little different – check out this article on how vodka affects the flavor. Good luck and I hope you enjoy this! I made this with zucchini noodles and shrimp (I’m not vegan) and it was great. The only thing I may change next time is the consistency. The cashew mixture was a little watery even after letting the cashews drain a lot. I may try coconut-almond milk instead of the water next time. But the taste was great! Really enjoyed this recipe! A Magic Bullet is fantastic for the solo diner (me) and small quantities. Grinds coffee beans and a whole lot of other stuff such as creamy mac n cheese sauce. It is a permanent fixture in my suitcase (nomadic vegan world travellermacs all enough to travel with in your carry on or checked luggage! And certainly compact enough for even the smallest kitchen. (No, I am not affiliated in any way shape or form with this product other than it works for me and my lifestyle). I’ve head that they’re great for small batch blending. :) Right now I use the Ninja for that, which is pretty good too. It has a very small food processor bowl. L O V E D this recipe, it made a lot, but that just meant leftovers. I think it tasted better after a day or two of sitting, but it was awesome on zoodles and even more awesome on polenta slices! Great recipe! I’ve made this twice now. The first time I followed the recipe closely, and the sauce ended up with a slightly metallic taste from the vodka. The second time, I used my good old crock pot on low for five hours or so, and the sauce was good enough to eat with a spoon for dessert! I did a little tweaking this time–adding about a tablespoon of honey, and also a couple of shredded carrots, sautéed with the onions. Thanks for the recipe. I also didn’t pre-soak the cashews when I used the crock pot. Oh nice! I’ll have to give it a try in the slow cooker myself. Thanks for the idea! I have a question regarding the crock pot version. Debbie didn’t pre-soak the cashews but do you still need to blend them in a food processor or is it ok to just throw them in the crockpot in their natural raw state? Thanks. Looks great! How much pasta do you serve it with? I was just wondering how much water you used to soak the cashews in! Thank you! Hi! I am getting married in a month My Husband to be and I are both Vegan but both of our families are carnivores. It has been challenging finding a caterer who will make yummy vegan cuisine that meat eaters will truly enjoy. Do you know if this sauce freezes well? I am thinking of cooking for my reception myself but it must be done ahead of time. I would like to serve at least 3 different pasta dishes so any suggestions would be appreciated! I’ made this tonight to go over pasta with eggplant and mushrooms. I subbed the onion for shallots and used parsley in the sauce. Amazing! So I have a question that I have wondered about for a while. What is the purpose of using both crushed tomatoes and diced tomatoes? P.S. I’m a huge fan of yours and have been following for quite some time. Love your recipes and your writing style! Hey Alissa! My kids and I loved this sauce!! I forgot to soak the cashews the night before so I used pureed white kidney beans instead and it was still awesome. I had is with spaghetti squash as I am watching my carbs and the kids had it on penne. 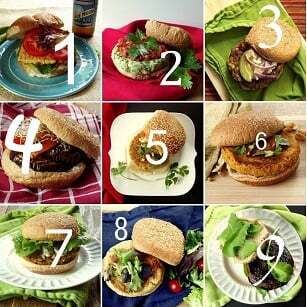 We love every recipe we try of yours! !Thank you! Oh, I bet this was awesome with white beans! I’ll have to give it a try! Glad you enjoyed it. Thanks Jenni! I made your recipe the other night for dinner (mine was really pink, which didn’t effect the flavor, it was just a surprise!) Of course since there are only two of us, there was a lot of sauce left over! The other day, I roasted some veggies thinking of a salad, wrap, or sandwich, my husband suggested lasagna instead so I made it last night. IT WAS FANTASTIC! The veggies were things I had on hand: asparagus, rainbow carrots, 3 garlic bulbs (I used 2 of them), 1 red onion, 3 golden beets (I used two of those also)and then I sautéed some shiitake mushrooms (in white wine and one Tbsp. olive oil). It was so delicious that my husband suggested I write and thank you for the yummy recipe & tell you what we did with the extra sauce! Thanks so much. You came through yet again! Oh that sounds delicious!! I’ve never tried this in a lasagna, but I’ve got a big container of it stashed away in the freezer, so maybe I will. :) Glad you enjoyed it! Thanks Marcia! Loved loved loved this! Having it again tonight—even better after it has sat for a couple of days. When you posted it, I had just gotten back from Sprouts with a can each of fire-roasted crushed tomatoes and diced tomatoes (a BOGO), so of course I took that as a sign to make it. Just had to wait until we obtained some vodka, which we got just for this recipe because experience has taught us that we love all your recipes. So full-flavored yet easy to make. Added green peas and mushrooms and broccoli to eat. Served over pasta that is 100% made of vegetables, so a dish that was both delicious and nutritious. Seems like you can master any cuisine/dish. You make my taste buds dance! I would recommend it, but I don’t have a very powerful blender so I’m not totally sure. If you’re short on time you could try boiling them for 15 minutes – that always works for me in a pinch! 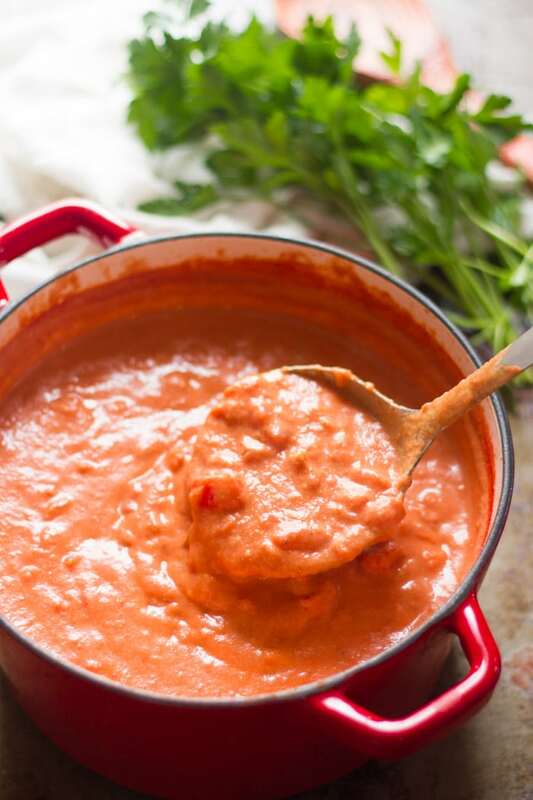 I love love love this sauce… Have made it quite often for adults, however need it to be kid and pregnancy friendly for an upcoming family party… I wonder what your thoughts are about alcohol burning off in the cooking process… I know I can just leave the Vodka out… Just wondering!? I’m so glad you’re enjoying it!! Honestly, I’m not sure. I’ve read that alcohol never cooks off completely, so if you’re concerened it might be best to leave it out. I think white wine would work! The flavor will be different, but I think it will still be delicious. One of the best recipes I’ve tried in the 5 years since having gone vegan. It’s absolutely delicious and tastes better than any other I’ve tried! I’m so happy to hear that!! Thanks so much Dana! Yes, thank you! The Vitamix is a high powered blender that can handle the unsoaked cashews without leaving them chunky. I’m glad you liked it! Enjoy! This may be a silly question, but should the onion be red onion or white? I was so excited to try this recipe, rosée sauce was my favourite before I became vegan. It’s good, but I found the vodka taste to be very strong, not to mention that I felt a little intoxicated after eating it (I don’t normally drink alcohol, so it really doesn’t take me much!). Do you think it would work as well without the vodka? Has anyone tried it? Morning! This recipe looks delicious! I’m wondering if I can make it ahead of time and then bake it in the oven . I’m looking for a recipe I can make for a crowd on Christmas. Thanks in advance! I really enjoy your recipes!!! Thanks Tricia! You can certainly make it ahead of time! I recommend reheating it on the stove though, and if possible cooking your pasta right before serving. Enjoy!! This is my favorite sauce! Great idea to use silken tofu! I’ll have to give it a try. So glad you enjoyed it!